The library of the Max Planck Institutes Stuttgart is a scientific library primarily for the members of the Max Planck Campus Stuttgart. External visitors are kindly requested to register. Please note that the library stock is only available for the employees of the two Max Planck Institutes! 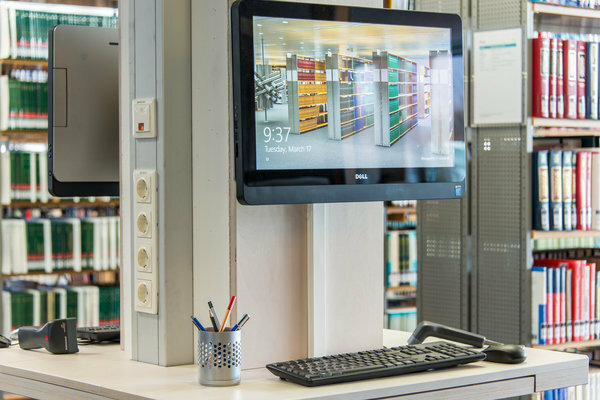 As a common library of the Max Planck Institutes for Solid State Research and Intelligent Systems we are responsible for the information and literature supply of our staff members and guests. Our aim is to support the members of the institutes in their daily research projects. In order to achieve this, we provide a current and attractive offer of information and services. The expansion of electronic media is of particular importance. A transparent way of working, both internally and externally, is self-evident for us. The library users are the first priority, an individual consulting of each user is important for us. We maintain an active exchange of information and knowledge among our colleagues and departments. We strive to constantly optimise the performance capability of the library. Regular further training ensures the necessary competence and promotes the further development of the individual employees. 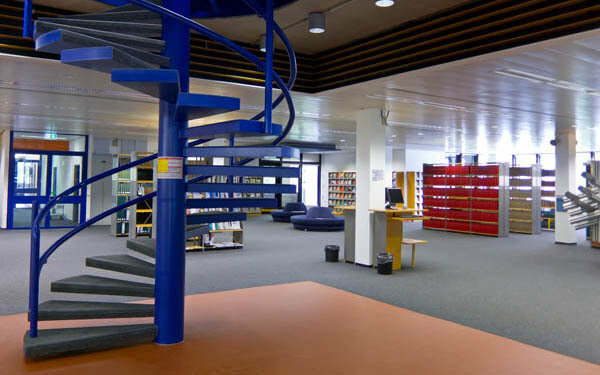 The meeting point is the information desk in the library on the second level (2 M1). Due to the new transformative agreement with American Chemical Society (ACS), starting in 2019, open access publication fees for articles with a CC-BY licence in ACS journals will be centrally covered if the "Corresponding author" is a scientist of the Max Planck Society. Furthermore the contract contains MPG-wide online access to the "All Publications" Package and the "Chemical & Engineering News" (C&EN). Projekt DEAL and the publisher Wiley concluded a nationwide Publish&Read agreement with a duration of three years. Due to the agreement all employees of the Max Planck Society will have online access to the journals of Wiley from the year of publication 1997 onwards. Furthermore the contract enables MPG scientists to publish articles in Wiley journals open access under a CC-BY license. In support of the Projektes DEAL, negotiations it was decided to discontinue the contract between the MPG and the publisher Elsevier. Generally, the library stock may only be borrowed by members of the institutes. The initial loan period is 60 days. Subsequently you can perform an online-extension until a maximum loan period of one year is reached. On level 3 you can find a book return box which allows you to return borrowed books at any time. Here you will find the guidelines for your user account and for the self-check-loan.. It is possible to use the self-check-loan at any time, even outside the opening hours. If you have any questions concerning the loan or your user account please contact us directly or send us an e-mail..
Journals cannot be borrowed. However, there is a copier available on level 2. If the library does not have a particular book you can send us a suggestion for acquisition. We will add the book to our stock as soon as possible. Please contact us directly, call us on 0711 / 689 - 1397 or e-mail us. You can get an overview of newly acquired books through our monthly list of new acquisitions. The list can be subscribed by RSS. If you wish to place an order, please call us on 0711 / 689 - 1397 or e-mail us. MPG.PuRe is the publishing repository of the Max Planck Society which contains bibliographic data of publications of Max Planck researchers. If you have any further questions about MPG.PuRe, please feel free to contact us personally or via e-mail. For further information about the publications of the Max Planck Institute for Solid State Research please contact Mrs. Asen-Palmer. The Max Planck Society plays a leading role on a national and international level in encouraging the free availability of scientific publications. The Max Planck Digital Library (MPDL) contributes to the shaping of the open access policy within the MPG and supports the open access activities at the Max Planck Institutes in collaboration with the libraries. Here you will find information on Open Access in general as well as on Open Access in the Max Planck Society and on OA Gold Agreements between the MPDL and publishers on the central cost assumption of article processing charges (APCs). You can search the library&apos;s collection in our local catalog Aleph. This includes monographs, serials and journals. Furthermore you have the option to borrow books yourself and to access your library account. Here you will find the guidelines for your user account and for the self-checkout. In addition, you can get an overview of newly acquired books through our monthly list of new acquisitions. A parallel search in our local print stock and the Max Planck Society&apos;s central e-books catalog is also possible. Generally, the library stock may only be borrowed by members of the institutes. The initial loan period amounts to 60 days. Subsequently you can perform an online-extension until a maximum loan period of one year is reached. On level 3 you can find a book return box which allows you to return borrowed books at any time. Here you can view the list of our printed journals as a PDF-file. The current issues and volumes are arranged on level 2M 1. Please note that the list does not contain any e-journals. You can search them in the Electronic Journals Library (EZB). The Electronic Journals Library (EZB) is a cooperative service of currently more than 628 libraries and institutions (including our library). It offers easy and convenient access to electronically published scientific journals in full text. The accessibility of the listed journals is represented by a traffic light system. The full text is freely accessible. The journal is freely accessible for the members of the Max Planck Institutes Stuttgart. Only some of the published volumes are accessible. Here you will find the conditions for access and instructions for use of individual journals. Please note: The systematic download of articles or search results, especially by robots, is prohibited and will initiate the publisher to block access to the journal for all users of the Max Planck Institutes Stuttgart! The central e-books-catalog offers you the possibility of searching the entire e-books collection, licensed by the Max Planck Society. Depending on the publisher you can read the texts on the PC and/or download them as a PDF-file. is a web application to navigate through scientific information resources available to staff and guests of the Max Planck Society. It includes licensed databases, digital collections, and reference works. In addition, recommandable retrieval tools available on the web free of charge are part of the collection. Moreover, almost all Max Planck Institute library catalogs, as well as selected external ones, are acessible from here. Here you will find regional and national catalogs, which might be of interest for your searches. The Union Catalogue of Serials (ZDB) is a catalog for printed and electronic journals, newspapers, serials and other periodical works. The central subject libraries serve as a national literature and information supplier for the highly specialized demands of science and research. They offer you comprehensive search possibilities, as it is their purpose to collect the publications of their subject as completely as possible and make them available through interlibrary loan. This includes publications within Germany and abroad as well as so-called grey literature (e.g. preprints). The Karlsruhe Virtual Catalog (KVK) is a metacatalog that offers you the opportunity to search different catalogs and directories at the same time. These are for example the above mentioned union catalogs and the Union Catalog for Serials (ZDB) as well as numerous international catalogs. The WorldCat is a catalog that provides access to inventory information from more than 10,000 libraries worldwide. A huge advantage of the catalog is that it supports Arabic, Bengali, Chinese, Cyrillic, Devanagaric, Greek, Hebrew, Japanese, Korean, Latin, Tamil and Thai characters. In the Max Planck Society two central retrieval services provide an overview of the worldwide flood of publications and keep the scientists informed. The information retrieval service of the CPT section is located within the library. is a database of records for graduate research, with over 2.1 million dissertations and theses included from around the world. In addition, nearly one million dissertations and theses are available for download in PDF format. is a comprehensive database that includes journals, comments, manuals, judgments, etc. (predominantly as a full text) concerning the German law. is a systematic and comprehensive resource of selected and critically assessed data in all areas of physical sciences and engineering. is a database of bibliometric data (Citation Indexing and Impact Factor of journals), supplemented by scientific fact databases. offers a comprehensive range of German and English literature for the economic and social sciences, law and psychology with access to the full text of selected journals. You will find a comparison of reference management software by the Max-Planck-Institute of Biochemistry in English here. You will find a comparison of reference management software by the Technische Universität München here. Shibboleth is a distributed access control system which opens a remote access to fee-based content on the web licensed by the MPG also outside of the IP-range of the MPG (e.g. during travel or at home). your FKF mail account, e.g. max.planck@fkf.mpg.de and password of the web-mail system. Because the basic Shibboleth technology is not available on all platforms, we are using a gateway to the existing IP controlled web (EZProxy). Using thes proxy allows access to all content on the web which is licensed by MPG (Grundversorgung by MPDL) as well as local licenses, even if you are currently not situated in the institute. Note: Please use only these links as bookmarks (or as shortcuts on your desktop).